Hi! I hope you're having a good weekend. Mine has been good, except for a sinus infection. But...I didn't let that keep me away from my craft table :) One of my stamping buddies came over to stamp with me yesterday, even though she's fighting an ear infection. Yes, we were quite the duo, huh Cheryl? Okay! Back to the challenge. 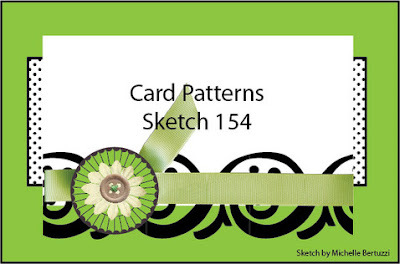 I'm playing along with the Card Patterns Sketch 154. You can take a look. Anyway, here's my take on the CP sketch. Oh, I love the colors of Kraft and Baja Blue together. I used several pieces of dsp from Stampin' Up! 's Elegant Soiree`. I think the color of the leaves is Soft Suede. I used a piece of kraft colored felt in a PTI die for the border. So soft! I sprayed the entire card with some Pearl glimmer mist, but I couldn't get it to show up in my photos. Thanks so much for taking a look. I hope you'll leave a comment! Love your colors! Those rolled flowers are so sweet! What a gorgeous creation, LOVE the felt border diecut! This is so elegant, love the border and fab flowers! beautiful! Thanks for joining us at Card Patterns this week!